In some ways it does not seem like it has been fifty years. In other ways, it seems like it has been even longer. This Friday, November 22, 2013, it will be fifty years since the assassination of President John Fitzgerald Kennedy. That day fifty years ago was also a Friday. I remember it was a sunny afternoon and I was sitting in Mrs. Prahl’s 6th grade class. If I remember correctly, we were studying math at the time. Sometime about 2:15 – 2:30 that afternoon, Mr. Gilbert, the principal came to the door, leaned against it and asked for attention. 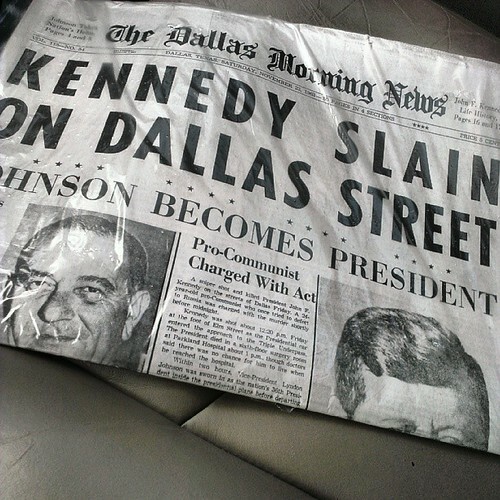 I seem to recall his eyes being red as he announced that President Kennedy had been shot and killed within the hour. I don’t remember much more from the rest of the school day but I don’t think we got much more studying done. My next memories of that day are from about 6PM. It was a Friday evening and we were going to a basketball game at Pendleton Co, the next county north of my hometown, where my mother was the librarian and ticket taker for ball games. She had stayed at the school that afternoon but my sister, who was attending Pendleton Co that year had come home then was going to ride back with my father and me. We watched the network news that evening showing the arrival of the coffin back in Washington, DC and I saw my father crying for one of the few times in my life. I don’t remember much else from that day. We all went to church that Sunday so we missed the shooting of Lee Harvey Oswald by Jack Ruby, although I know we watched the scene of that shooting replay multiple times over the next few days on the TV news. Today “the boots facing backward symbolize [that] the fallen won’t ride again and [the rider is] looking back on his family one last time,” he said. The next few years after President Kennedy’s death saw a roller coaster of action. The passing of the Civil Rights Act, one of President Kennedy’s signature legislative pieces even as it did not pass until the next year. The assassinations of Martin Luther King and Robert F. Kennedy in 1968. The landing of men on the moon in 1969, fulfilling President Kennedy’s vow to place a man on the moon within 10 years of his inauguration. Riots in the ghettos of cities throughout the US. The build up of troops in Vietnam, the scenes of death brought into our homes each night, and the upheavals on college campuses nationwide in protest. My experiences and memories of this weekend are not appreciably different than those of millions of others. It is just one of the collective touch points of life in the US in the 1960s. I’m not going to address the Warren Commission Report or any of the conspiracies from over the years and request you do not do so either. Let’s just reflect on a life ended too soon and the subsequent end of a part of the national innocence. Time for Multi-Party Democracy in the USA?